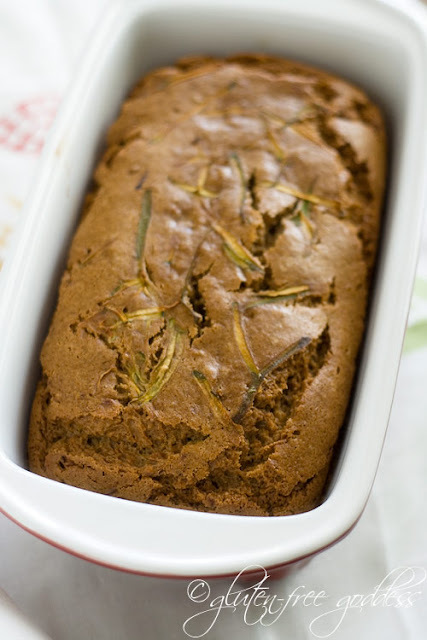 Sharing a favorite summer recipe here on Gluten-Free Goddess– a cinnamon laced tea bread made with garden fresh zucchini. You’ll love it. Now I’m off to read: The Life-Changing Magic of Tidying Up: The Japanese Art of Decluttering and Organizing — Cheers! Here’s my all-time favorite baking pan for gluten-free breads. It’s a lovely glazed ceramic pan that creates steady, even heating for gluten-free batters. In other words, it’s as foolproof as you can get. Find it here at Amazon: Good Cook 9-Inch Ceramic Loaf Pan . Make sure your batter isn’t cold when you put it into the oven. If you keep your flours in the fridge, for instance, this will cool down your batter quite a bit. If you find your tea breads and cakes turning out gummy, or falling after baking, you may want to take your oven’s temperature- some ovens never quite reach the proper temperature. You can combat this by baking longer, or upping the temp a bit. If the oven temp is not the issue, then start adding a tablespoon or two less liquid to your batters (you may live in a humid climate and your flours may be absorbing moisture; too much moisture can make for a gummy product).